THREE bikies waiting to testify in a trial in a Maroochydore Magistrates Court were ordered by a police sergeant to disperse from the area or face possible jail. The order is a sobering side effect of the State Government's new anti-association laws. "Basically, they were told they would be arrested if they didn't get out of the courthouse," Tony Jardine, of the Rebels' Sunshine Coast Chapter, said. Two of the bikies admitted to the Daily that they feared the technical breach of the new anti-association laws would result in their immediate imprisonment for a mandatory six months. The incident flared into a verbal confrontation on the second floor of the courthouse, in full view of other members of the public, as the bikies argued that they were only there together to appear in the trial. Police responded that the bikies were gathered in a public place, which is now illegal. Tony Jardine leaves Maroochydore courthouse. Attorney-General Jarrod Bleijie said the Government made no apologies for its tough stance. 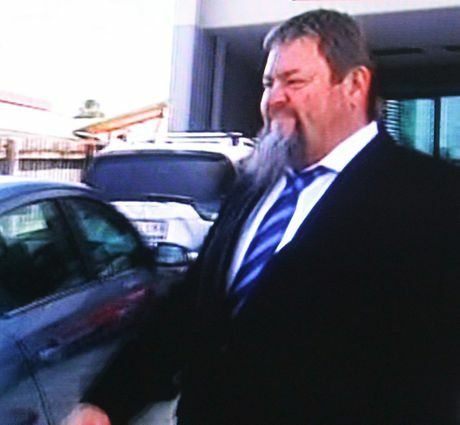 The bikies were at the court to give evidence on behalf of the Rebels Motorcycle Club Sunshine Coast chapter, which was charged with exposing liquor for sale without a licence. Mr Jardine authorised a guilty plea on behalf of the club. The court heard police had raided the club's Kunda Park clubhouse on May 14 and seized a number of items, including considerable quantities of beer, spirits and flavoured mixers, drinks cards, hole punches, a liquor purchase receipt and more. Prosecutor Sgt Rick Pallister said few people were at the premises at the time, the club was not open to the public, nobody was at the door selling tickets and no signs promoting alcohol sales could be seen. However, he said liquor laws were designed to ensure public safety, and the absence of a licence meant the club avoided usual legislative requirements. Magistrate Bernadette Callaghan described the offending as being at the "lower end of the scale". She noted that political parties, fishing clubs and football clubs, for example, also held similar drinks events. Ms Callaghan fined the club $2000 and ordered the seized items be returned.